The final AIMS Children’s Series event of 2017 was held on 26 November in Khanivali, a small village about 80km north of Mumbai. This year the distance was reduced from 4km to 2km and the previous out-back course changed to become point-to-point. This allowed another 133 children from a nearby orphanage to be accommodated on the course. Most children run barefoot and the organisers had patched up the route with loose soil as best possible. There were three age groups both for boys and girls, the children being from grades 8, 9 and 10. A total of 610 registered and 550 participated on the day. All the children completed the race and many clocked impressive times. The fastest was 7:02 and the next only a second slower. All participants were given a finisher’s medal and a race T-shirt, a canvas school bag, a warm sweater, a warm cap, a summer cap, a pair of canvas shoes (measured individually for size), two pairs of socks, 2 notebooks, 8 ball-point pens, 4 packets of biscuits, a Rubik’s cube, a Frisbee, some hard candy and chocolates, a geometry set, a lunch box and a water bottle. All the boys were given a cricket bat and ball and the girls a pair of badminton rackets and a shuttle. Everyone was provided with breakfast before they assembled for the race and lunch afterwards including ice cream for dessert. Every child also had their picture taken after the race and a copy was printed out and handed over to them on the spot. The winners received gold, silver or bronze medals, a certificate and a Casio watch for boys and a Timex watch for girls. Race director Amit Sheth had recruited a team of 40 volunteers from the Borivalli National Park Green Runners in Mumbai and from the Inner Wheel Club of Bombay Sea Coast. Following lunch there was a party of epic proportions where the children, teachers and organising staff joined in a dance competition. More prizes (solar lamps and watches) were handed out to children who danced well. Eliud Kipchoge and Mary Keitany have been voted by AIMS members as the best male and female marathon runners of the year (from October 2016-September 2017). The ceremony took place at the birthplace of the Marathon, Athens, in the evening of 10 November 2017 at the fifth annual AIMS Best Marathon Runner (BMR) Gala. Eliud Kipchoge was unfortunately unable to attend the Gala to collect what was his award, which he won for the third consecutive year. This year he won the BMW Berlin Marathon in a world-leading time of 2:03:32. In May, Eliud he had taken part in an ‘assisted’ time trial on the Monza Formula 1 racetrack in which he recorded a time of 2:00:25. It was the fifth time Mary Keitany had been presented with an award by AIMS, equalling the number received by Paula Radcliffe. She was presented with the AIMS World Record award only one week earlier month in recognition of her women’s-only Marathon world record of 2:17:01 set in London on 23 April. 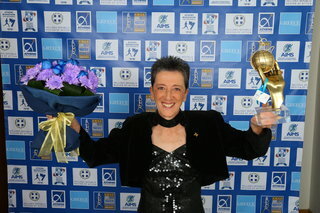 Rosa Mota received the Lifetime Achievement Award at the Gala in recognition of her long career in distance running including victories in the 1988 Olympic Games, the 1987 and 1991 World Championships and the 1982, 1986 and 1990 European Championships. Rosa first came to international attention in 1982 at the European Championships where she won the first official international championship marathon for women, staged on the classic course from Marathon to Athens, Greece. In addition to the Olympic gold won in Seoul, South Korea she also won an Olympic bronze and many marathons around the world including Rotterdam, Chicago (twice), Tokyo, Boston (three times), Osaka and London. The Sanlam Cape Town Marathon took the AIMS Green Award for their commitment to environmentally friendly practices. For the 2016 event, the entire carbon footprint was measured and offset to win climate neutral certification. 331 tons of CO2 was offset by supporting three local South African charity projects – Wonderbag, Reliance Compost and Basa Magogo. The 2017 race achieved zero waste to land-fill. 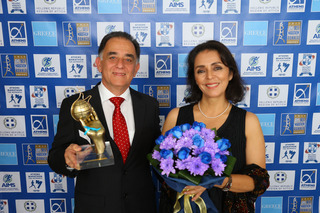 The Maratón de las Flores Medellín won the AIMS Social Award in recognition of their support for social causes. In 2017, the race organisers supported a landmine charity, a race organised by a breast cancer charity and Pasos de Felicidad, a movement of young runners raising money for disadvantaged communities. The 2017 AIMS Best Marathon Runner (BMR) Awards were co-organised with the Hellenic Athletics Federation (SEGAS), ‘Athens Marathon. The Authentic.’ and the Region of Attica, held under the kind sponsorship of the ‘Greek National Tourism Organisation’ and ‘Athens International Airport’. As the organisers of the Athens Marathon. The Authentic look back on a record entry of 18,500 runners on Sunday for the 35th edition of their historic race, they are also looking to the future. Future participants in the race from the town of Marathon to the 1896 Olympic Stadium should not fear that this proposal would reduce the historical significance of the race. The event has grown in popularity among spectators as well, with a record attendance of more than 100,000 along the route. The Standard Chartered Singapore Marathon (SIN) will take place on Sat 8 December 2018, not Sun 2 December 2018 as previously published. 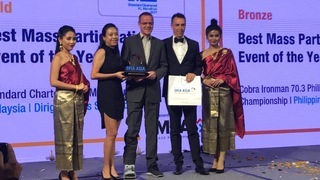 The Standard Chartered KL Marathon (MAS) won ‘best mass participation event’ at the Sports Industry Awards Asia 2017. 2018’s event will take place on 8 April, not 8 May as previously published. The Sanlam Cape Town Marathon was presented with the AIMS Green Award for their commitment to environmentally friendly practices. For the 2016 event, the entire carbon footprint was measured and offset leading to climate neutral certification and IAAF Gold Label Status. In total, 331 tons of CO2 was offset by supporting three local South African charity projects – Wonderbag, Reliance Compost and Basa Magogo. The race also achieved a zero waste to land-fill policy in the 2017 race. The Maratón de las Flores Medellín was the 2017 recipient of the AIMS Social Award in recognition of their support for social causes. In 2017, the race organisers committed to support United for Colombia, a landmine charity, a race organised by a breast cancer charity and Pasos de Felicidad, a movement of young runners raising money for disadvantaged communities. The AIMS Lifetime Achievement Award was presented to the Portuguese distance running legend Rosa Mota in recognition of her incredible career in distance running. In addition to the Olympic gold won in Seoul, South Korea she won an Olympic bronze, World Championship gold and three European Championship golds throughout her career. She was also greatly successful in marathons around the world, winning the Rotterdam, Chicago (twice), Tokyo, Boston (three times), Osaka and London marathons. Running is a way of living a healthy lifestyle and promoting human values for more and more people around the world as well as driving national and global tourism. The Association of International Marathons and Distance Races (AIMS), representing 435 of the world’s best distance races across 114 countries, including the Athens, Berlin, Boston, Chicago, New York & Tokyo Marathons held its 11th AIMS Marathon Symposium today (11 November 2017) in Athens, Greece. The Symposium was arranged in collaboration with SEGAS (the Hellenic Athletics Federation) and ‘Athens Marathon. The Authentic.’ and has been held annually since 2007. AIMS would like to thank our partners and sponsors, in particular the ‘Region of Attica’ as co-organiser of the Symposium and the ‘Greek National Tourism Organisation’ and ‘Athens International Airport’ as official sponsors for all their help and support. The theme of the 2017 Symposium was “Developing your race through the development of the running market in your region”. Attendees heard from Paco Borao, AIMS President and Race Director of Marathon/Half Marathon Valencia Trinidad Alfonso EDP. Mr. Borao talked with the Symposium about the impressive development of running in Valencia, Spain where they have built the ‘Valencia City of Running’ brand as ‘the best destination to visit for running’ and making ‘Valencia an amusement park for runners’. The City of Valencia has built a permanent 5k track that now sees 15–20,000 runners using it every week. Mr. Borao summed up the theme of the speakers at the symposium that ‘building successful events comes from building and maintaining meaningful communication and engagement with runners throughout the year’. Makis Asimakopoulos, Ph.D., General Manager “Athens Marathon. The Authentic”. Talked about the importance of developing a ‘running culture’ and identifying and promoting your race’s unique selling point: ‘USP’. Under the brand ‘Run Greece’ from a starting point of 15,000 runners, a Greek running community of over 215,000 runners has been developed. 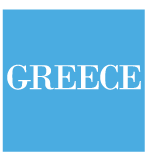 Impressively during a time of financial crisis in Greece a sponsorship partner programme of over 2 million Euros has been created covering a wide range of events which has been invested in developing the health of the nation through athletics and in particular running. Sašo Belovski, Business Development Director at RunCzech the organisers of the world-famous Prague Marathon in the Czech Republic talked about how they have managed to build from a race of 958 runners to a running community of 91,300 people, broadcasting into 715 million homes. A large part of that success has been creating a loyalty programme that sees runners access a range of benefits. RunCzech have measured eight hundred 5-kilometre courses around the Czech Republic and provide 40 coaches to encourage people to run throughout the country. Each year a candle is lit on Robben Island, where Nelson Mandela spent 18 of the 27 years he was held in Prison, and then from that a torch is lit and carried to Cape Town to celebrate the start of the marathon. Eliud Kipchoge and Mary Keitany are officially the top marathon runners of 2017. 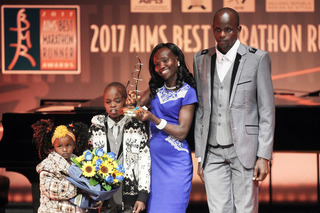 The Kenyans were announced as the winners of the AIMS Best Marathon Runner (BMR) Awards at the Gala in Athens on Friday. The event was organised by the Association of International Marathons and Distance Races (AIMS) and the Hellenic Athletics Federation, SEGAS. Kipchoge completed a hat-trick of AIMS awards after being voted top male marathon runner in each of the past two years and ran the world’s fastest time of 2017 so far to win the Berlin Marathon in 2:03:32 at the end of September. Mary Keitany (pictured at the gala with her family) also produced another year of impressive performances, breaking the women-only world record with 2:17:01 to win the London Marathon in April. The winners of the BMR awards were decided by the votes of more than 400 members of AIMS. Over the past 12 months Eliud Kipchoge has once again demonstrated his mastery of the marathon. Not only winning in Berlin but leading the attack on the two-hour barrier in the unorthodox setting of Monza’s Formula One circuit in May. Kipchoge left the Italian racing circuit with 2:00:25 to his credit and his belief in this quest stronger than ever. The Sanlam Cape Town Marathon won the AIMS Green Award while the Maraton de los Flores Medellin received the Social Award. The Portuguese distance running legend Rosa Mota will be presented with the AIMS Lifetime Achievement Award at the fifth annual AIMS ‘Best Marathon Runner’ (BMR) Awards Gala, to be held in the home of the Marathon in Athens, Greece on 10 November 2017. Rosa’s career will be honoured on behalf of the AIMS Members who represent more than 435 of the world’s leading and most prestigious races from 114 countries and territories, including the ‘Athens Marathon. The Authentic’, Beijing, Berlin, Boston, Chicago, Comrades, New York, Paris & Tokyo Marathons. The AIMS Lifetime Achievement Award will be presented to Rosa in recognition of her incredible career in distance running. Born in Porto, Portugal in 1958, Rosa first came to international attention in 1982 at the European Championships where she won the first official international championship marathon for women, staged on the classic course from Marathon to Athens. In 1988 at the Olympics in Seoul, South Korea, Rosa became the first Portuguese sportswoman to win Olympic gold by winning the marathon. In addition to the gold in Seoul she won an Olympic bronze, World Championship gold and three consecutive European Championship golds throughout her career. She was also greatly successful in marathons around the world, winning the Rotterdam, Chicago (twice), Tokyo, Boston (three times), Osaka and London marathons. In total, Rosa competed in 21 marathons in her career, winning 14. The world running organisation the Association of International Marathons and Distance Races (AIMS) is delighted to announce that Kenya’s Mary Keitany has been recognised with the AIMS World Record Award. Mary broke the women’s only Marathon world record by 41 seconds at the Virgin Money London Marathon on 23 April 2017 in a time of 2:17:01. TCS New York City Marathon Race Director Peter Ciaccia presented her with the award in advance of the Marathon – in which she is scheduled to compete. The record had stood for 12 years since Paula Radcliffe won the London Marathon in 2005 in a time of 2:17:42. Paula set the women’s Marathon World Record for mixed gender races in 2003, also at the London Marathon (2:15:25). The time of 2:17:01 has been officially recognised as the world record by the IAAF (International Association of Athletics Federations) and by AIMS (Association of International Marathons and Distance Races which represents over 435 distance running events in 114 countries and territories). AIMS set the world record criteria for performances on the road later adopted by the IAAF. AIMS have been awarding athletes in recognition of world record breaking performances since 1985. This is the fourth time AIMS has presented an award to Mary. She received the AIMS World’s Fastest Time Award in 2011 in recognition of the 1:05:50 she ran in the Ras al Khaimah Half Marathon (UAE) while her outstanding form in 2009 and 2011 won her the ‘AIMS/ASICS World Athlete of the Year Award’ in both years. Mary is now the third most decorated female athlete in the history of AIMS. Only Paula Radcliffe (GBR – 5 Awards) and Tegla Loroupe (KEN – 6 Awards) have been recognised more than Mary. An increasing number of cities today stage marathon races as part of their annual menu of events but there is only one which can claim to be the original: The “Athens Marathon. The Authentic” will be run on November 12 on the original course with the start in the small coastal town of Marathon and finishing in the old Olympic arena of Athens, the marble Panathenaic Stadium. It was this same route which the runners trod for the first Marathon of modern Olympic era in 1896. 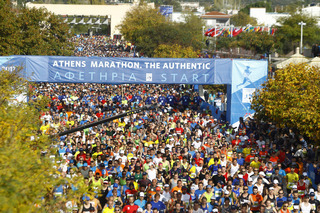 The unique historical background to the race attracts more and more runners to the Athens Marathon each year. A record number of 18,500 athletes have entered the race over 42.195km, an increase of more than 1,000 than a year ago and the maximum limit for the event’s capacity. Out of this participation, an amazing 8,500 runners will travel to Athens from more than 100 countries from all continents. Additionally the Athens Marathon is recognized by thousands of the sports lovers and receives attention throughout the world. Among those entered is the winner of the women’s title last year, Nancy Arusei. She and her fellow Kenyan Milton Rotich will be the favourites for the race on November 12. Last year Nancy Arusei sprang a surprise on her marathon debut. At her first attempt at the marathon, the Kenyan ran the extremely tough course in 2:38:13. “I would never have thought it possible that I could win,” said Arusei after the most significant win of her career. 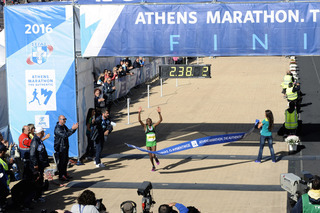 This year she finished second in the Agadir Marathon in Morocco, clocking 2:29:12 but the course was found to be short of the official distance so her time in Athens remains her personal best. The women’s race will provide a chance to renew the contest between first and second place finishers of last year in the “Athens Marathon. The Authentic“. Kenza Dahmani of Algeria finished just 15 seconds behind Nancy Arusei with 2:38:28 in 2016 and has since improved her best to 2:33:21 with victory at the Lodz Marathon in Poland in April. The contest for top honours is also likely to feature Hemila Wortessa. The Ethiopian should be a contender after her third place at the Wuxi Marathon in China this year in 2:31:50. The men’s favourite is Milton Rotich of Kenya although the hilly course makes predictions a difficult business and the race from Marathon to Athens has consistently thrown up surprises. The 33-year-old Rotich has a personal best of 2:08:55 and, like Nancy Arusei, thought at first that he had bettered that performance this year when he ran 2:07:57, also in Agadir. Among his challengers should be Chala Damessa and Samuel Kalakei. Damessa of Ethiopia won the Gunsan Marathon in South Korea last year with 2:11:45 while Kenya’s Kalalei achieved his best time of 2:11:47 in Metz in France last year. In 2017 the 22-year-old finished third in the Stockholm Marathon in 2:12:36. The global distance running organisation, the Association of International Marathons and Distance Races (AIMS) are pleased to announce the Sanlam Cape Town Marathon will receive the 2017 AIMS Green Award. The award which recognises excellence in environmental practice will be presented to the South African race at the fifth annual AIMS ‘Best Marathon Runner’ (BMR) Awards Gala to be held in the birth place of the Marathon in Athens, Greece on Friday 10 November 2017. Candidates for the AIMS Green Award are judged on the impact the race has had on promoting environmentally friendly practices in marathon events, how volunteers contribute to the success of the project and the ability for the race to educate younger generations about the benefits of sport and environmental protection. The two other shortlisted races were the Vodafone Istanbul Marathon (Turkey) and the SwissCityMarathon from Lucerne (Switzerland). The Award, in its fifth year, received applications from around the world, showing that environmentally sustainable practices are becoming more prominent in AIMS member races. The Sanlam Cape Town Marathon has placed environmental policies at the heart of their event. For the 2016 event, the entire carbon footprint was measured and offset leading to climate neutral certification and IAAF Gold Label Status. Measuring the carbon footprint of the race included the transport (by air and car) of athletes. In total, 331 tons of CO2e was offset by supporting three local South African charity projects – Wonderbag, Reliance Compost and Basa Magogo*. By benchmarking against leading international city marathons, the Sanlam Cape Town Marathon has pledged to become a leader in sustainability initiatives for years to come. An extensive environmental and waste management plan has been created with many ambitious targets such as achieving a zero waste to land-fill policy, which was achieved in the 2017 race. These actions all come under the banner of ‘Run4Change’, a legacy program that supports the following five pillars; sustainability, development, charities, health, development and peace. The Association of International Marathons and Distance Races (AIMS), a running organisation representing some of the world’s leading distance races, is delighted to announce the Maratón de las Flores Medellín as the 2017 recipient of the AIMS Social Award. The award, which recognises races working towards achieving the United Nations Millennium Development Goals, will be presented to the Colombian race during the fifth annual AIMS ‘Best Marathon Runner’ (BMR) Awards Gala to be held in the birth place of the Marathon in Athens, Greece on 10 November 2017. Each year, the Maratón de las Flores Medellín supports social causes as part of their event. United for Colombia (UFC): The Maratón de las Flores has supported the UFC since 2003 by sponsoring rehabilitation for people injured by land mines. The efforts also include fundraising to support the cost of prosthetics and organising an additional race during the year to support this cause. Breast Cancer: The Avon Foundation and Fundayama held the 2nd edition of the ‘Avon Run/Walk for Breast Cancer’ in October 2017, organising a 10k and 5k event. As one of the leading events in Colombia, the Maratón de las Flores supports the cause by communicating directly about the event with their entrants, thousands of runners in Colombia and around the world. Pasos de Felicidad: is a movement of young runners raising money for disadvantaged communities. The runners participating in this program support these runners by donating 1,000 Colombian pesos for every km they run in the Maratón de las Flores. Hence, for completing the marathon a donation of 42,000 pesos is made. Kitata chopped almost two minutes off his personal best in difficult conditions while Cheruiyot, the reigning Olympic 5,000m champion but now concentrating on road racing, improved her best for the marathon to 2:23:35 after her distance debut in London this April. Kitata ran 2:05:50 to win the men’s title and his compatriots Kelkile Gezahegn (2:06:56) and Getu Feleke (2:07:46) ensured a clean sweep for Ethiopia. The Ethiopians Yebrgual Melese (2:24:30) and Meskerem Assefa (2:24:38) finished second and third behind Cheruiyot in the women’s race. The women’s champion had been on course to improve the course record of 2:21:01 but was slowed by strong winds in the closing stages. The race was also notable for strong results by the European men. Dewi Griffiths of Wales ran a fine debut with 2:09:49 for fifth place and at one stage looked capable of breaking the UK record for a marathon debutant, held by his fellow Welshman and former world record holder Steve Jones with 2:08:05 when winning Chicago in 1984. Directly behind Griffiths came the German record holder Arne Gabius with 2:09:59 and Poland’s Henryk Szost was next across the line on the red carpet of the Festhalle with 2:10:09. 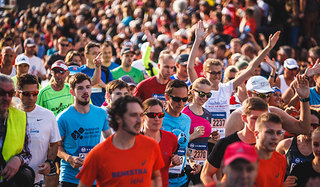 14,513 runners from 108 countries took part in the Mainova Frankfurt Marathon which is an IAAF Gold Label Race. “The conditions were better than expected for the runners but still demanding enough for the runner. We were very anxious about the weather but in the end the running conditions were pretty good and that is reflected in many top quality performances among the results,” said the race director Jo Schindler. Despite difficult conditions the winner Shura Kitata Tola ran 2:05:50 for the sixth fastest winning time for the marathon in the world this year. It was also the eleventh fastest performance of the year. Arne Gabius commented on the solid European performances, notably from Dewi Griffiths, himself and Henryk Szost, that: “Things are on the up in European marathon running and that is all to the good.” As for the women’s field, eight runners finished under 2:30, another notable achievement. In her second marathon the Olympic 5,000m champion Vivian Cheruiyot ran a personal best of 2:23:35, improving by 15 seconds over her debut time for fourth place in London in April. She dominated the women’s race from the start, going through halfway in 70:07, more than two minutes ahead of her rivals. For much of the race Cheruiyot was on course to break the course record of 2:21:01, reaching 30km in 1:40:14. Strong winds slowed her pace, however: “Winning here has boosted my confidence. It was very windy. My body is small and running was hard. I had to knuckle down and thought I could run 2:20. But I am happy with my time. I’m still new to the marathon and can improve,” said Vivian Cheruiyot. Yebrgual Melese finished second in 2:24:30 ahead of her fellow Ethiopian Meskerem Assefa with 2:24:38. Both were able to make inroads on Cheruiyot’s lead in the closing stages. Another with good cause for celebration in the Festhalle was the American Sara Hall who continued her improvement with a personal best of 2:27:21. While Arne Gabius won the German men’s title as expected, there was a surprise outcome among the women as Katharina Heinig overtook last year’s national winner Fate Tola in the closing stages to finish eighth and best European woman in 2:29:29. Tola finished ninth in 2:30:12, both runners coming home well inside the qualifying time for the European Championship Marathon in Berlin next year. Speakers for the 11th AIMS Marathon Symposium to be held in Athens on 11 November 2017 have been confirmed. The Symposium theme is “Developing your race through the development of the running market in your region” to be addressed by Paco Borao, AIMS President, race director of Marathon/Half Marathon Valencia Trinidad Alfonso EDP; Makis Asimakopoulos, Ph.D., General Manager “Athens Marathon. The Authentic”; Sašo Belovski, Business Development Director at RunCzech; Elana Meyer, Ambassador of Sanlam Cape Town Marathon. The Symposium is arranged in collaboration with SEGAS (the Hellenic Athletics Federation) and ‘Athens Marathon. The Authentic’ (to be held the following day, 12 November). AIMS would like to thank them and the ‘Region of Attica’ as co-organiser of the Symposium and the ‘Greek National Tourism Organisation’ and ‘Athens International Airport’ as official sponsors. 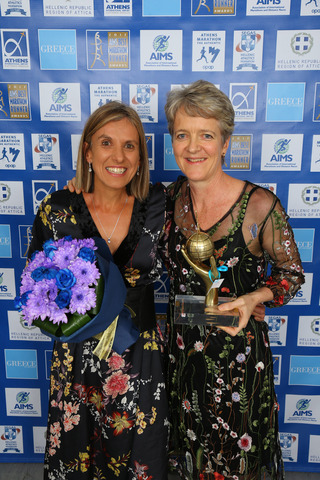 The AIMS Best Marathon Runner Awards Gala will be held on Friday 10 November at which the male and female Marathon runners voted as such by AIMS member races will be presented. The male award is contested by Geoffrey Kirui, 2017 IAAF World Marathon Champion and Eliud Kipchoge, winner of the BMW Berlin Marathon in a world-leading time of 2:03:32. Candidates for the female award are Rose Chelimo, 2017 IAAF World Marathon Champion and Mary Keitany, winner of the London Marathon in a new women-only world record time of 2:17:01. Other awards will be made to AIMS member races who have displayed best practice in environmental and social policies. The AIMS Lifetime Achievement Award will be presented to someone who has made a major contribution to the sport of distance running. European Athletics will host a ‘Running Business’ conference in Frankfurt on 27–28 October prior to the Mainova Frankfurt Marathon on 29 October. The conference will consider the state of the sport in different geographical regions and with respect to the different kinds of races now commonly held. Ideas will be offered on how to attract runners by all channels now available to a race organiser. Jocelyne Jepkosgei (KEN) beat her own world record in the Valencia Half Marathon Trinidad Alfonso on 22 October, running one second faster than the time she set earlier this year in Prague (1:04:51 to 1:04:52). It is her sixth world road record of the year having also broken the 10km record in Prague (twice along with those for 15km and 20km). Getu Feleke is the man with the fastest credentials going into the Mainova Frankfurt Marathon on October 29. The 30-year-old Ethiopian has a highly impressive best of 2:04:50 and also ran a superb course record of 2:05:41 in the 2014 Vienna City Marathon. His compatriot Feyse Tadese is the fastest starter in the women’s field with the world class time of 2:20:27. The Mainova Frankfurt Marathon has been adding to its elite field in recent weeks and the full field has now been announced. In total the organizers expect around 14,500 participants for this IAAF Gold Label Road Race. Half a dozen male athletes on the current start list have personal bests of under 2:08 and three more, including Germany’s national record holder Arne Gabius with 2:08:33, have broken 2:10. Frankfurt will mark a return to action after a lengthy break because of injury for Getu Feleke. Among his rivals will be the defending champion Mark Korir of Kenya, who ran 2:06:48 for victory last year and has a best of 2:05:49, making him the second fastest man in the field. Back with an aim of moving one place higher on the podium is last year’s runner-up Martin Kosgey of Kenya, whose best is 2:07:22. One name missing is the runner who finished third in 2016 since fellow Kenyan Cybrian Kotut is injured. Seven women among the elite field have broken 2:25, setting the stage for what is likely to be another thrilling contest. Vivian Cheruiyot of Kenyan won the Olympic 5,000m title in Rio in 2016 but is now concentrating on road racing. She ran 2:23:50 on her marathon debut and will face five rivals who have run faster. Fastest among them is Feyse Tadese: the 28-year-old Ethiopian has a best of 2:20:27 for second place in Berlin in 2015 and also finished fourth in London earlier in the same year. Also to be reckoned with should be Fate Tola of Germany, runner-up last year who has a best of 2:25:14. The TbilisiHalfMarathon (GEO) on 22 October will go ahead, organisers have stated, starting at 0830. The Paavo Nurmi Marathon (FIN) will take place on Sat 18 August 2018, not Sat 30 June 2018 as previously published. The Standard Chartered Nairobi Marathon (KEN) will take place on Sun 26 November 2017, not Sun 29 October 2017 as previously published. The Dhiraagu Maldives Road Race (MDV) will take place on Fri 24 November 2017, not Fri 6 October 2017 as previously published. The Gatorade Caracas Rock 10K (VEN) will take place on Sun 19 November 2017, not Sun 1 October 2017 as previously published. AIMS and ‘Marathon-Photos.com Ltd’ have extended their sponsorship agreement for a three-year term. Marathon Photos will retain their position as ‘Photo Partner’ of AIMS until 2020. They first sponsored AIMS in 2002 and have maintained that sponsorship throughout. Founded in 1999 Marathon Photos have grown into a world leader in the provision of photo and video content to races and their runners through all forms of communication in the digital age, photographing more than 650 events in 35 countries annually. The women’s elite field for the BMW Berlin Marathon on Sunday is ripe with talent, featuring five runners whose personal best is under 2:25. 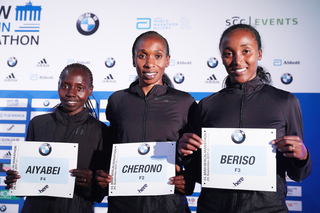 Gladys Cherono is the favourite among this quintet, having already won the race in 2015 with a world-class time of 2:19:25, going within 13 seconds of breaking the course record, set in 2005 by the Japanese Mizuki Noguchi (2:19:12). A record number of 43,852 runners from 137 countries have entered the 44th edition of the BMW Berlin Marathon. The race, the biggest one-day sports event in Germany, is an IAAF Gold Label event and one of the Abbott World Marathon Majors series. Gladys Cherono wants to show she is back to her best by producing a world-class time. “I’ve come to Berlin to attack my personal best,” said Cherono. The 34-year-old Kenyan achieved the fastest marathon time anywhere in the world since April 2012 with the performance she produced in Berlin in 2015. But a lengthy period of injury in the spring of 2016 put paid to chances of going to the Olympics. “I couldn’t run a marathon in 2016 because I had a stress fracture and feared I might never regain top form. But now everything is ok,” said Gladys Cherono. Another Kenyan who plans for a very fast race is Valary Aiyabei. The 26 year-old had a breakthrough performance in Prague this spring. She improved by almost three minutes to 2:21:57 after running the first part of the race at world record pace. It was the third marathon win in a row for Valary Aiyabai, who recorded first places in Barcelona and Valencia in 2016. “My aim is to equal the time I ran in Prague, but I hope for a personal best. My husband, who is also my coach, will pace me on Sunday. He is my everything,” said Valary Aiyabai. Germany’s Anna Hahner admits that she is not yet at her best after a long injury break and will not be able to challenge her personal best of 2:26:44. “But the qualification time of 2:32:00 for the European Championships next year in Berlin is a goal,” she said. Swiss record holder Maja Neuenschwander hopes to produce at least a similar performance to that of two years ago when she ran the national record of 2:26:49 in Berlin. “Conditions are always superb in Berlin. If you come here you simply have to make use of these conditions and run as fast as possible. I am looking forward to Sunday and may be I can run a PB,” Maja Neuenschwander said. Vivian Cheruiyot is the most successful runner ever to enter the Mainova Frankfurt Marathon. The list of her achievements is impressive with not only an Olympic 5,000m title but five World Championship gold medals to her credit. In 2011 in Daegu in South Korea she did the double, winning both 5 and 10,000m titles. After an extraordinary career on the track the 34-year-old has a new target in view: achieving similar excellence in the marathon. Cheruiyot made her debut at the distance in London this April, finishing fourth in the high quality field in 2:23:50. Frankfurt will be her second marathon and the Kenyan is confident of making considerable improvement if conditions are good. Among the factors making the recruitment of Vivian Cheruiyot possible was an attractive bonus offer with the Frankfurt Messe playing a decisive role. The event is putting up a cash prize for the woman who breaks the course record which currently stands at 2:21:01, set by the Ethiopian Meselech Melkamu five years ago. If a woman breaks the record in Frankfurt’s Festhalle on October 29, they will earn 30,000 Euro, which will be paid by Frankfurt Messe. “We are very grateful to the Frankfurt Messe for their support. Combining with them has helped secure Vivian Cheruiyot for the Mainova Frankfurt Marathon,” said Jo Schindler. ‘Trofeos y medallas deportivas, S.L.’, the Spanish trophy and medal engraving company have been announced as the ‘Medal Laser Partner’ of AIMS. The three-year agreement provides for working with AIMS to provide an innovative, personalised service to runners around the world until 2020. Founded in 2002, the company have recently developed a cutting edge ‘Medal Laser System’ that provides runners with a personalised engraved record of their performance immediately after finishing the race. The ‘Medal Laser System’ accesses the time recorded by the chip carried by each runner. The runner shows their bib number for engraving and within 6 seconds their name and finishing time is engraved on their medal. This provides a personalised memento of each runner’s achievement. The ‘Medal Laser System’ creates positive partnerships with races to bring their service to runners. Full details of the service can be found at http://www.medallasser.com. Announcing the deal, AIMS President Paco Borao commented: “We are delighted to announce this partnership. I am sure that the ‘Medal Laser System’ will be of interest to our members and their runners and will help provide personalised mementos of their achievements. A further medical conference will be held in conjunction with the Marine Corps Marathon on 21–22 October at the W. Proctor Harvey Clinical Teaching Amphitheater of Georgetown University School of Medicine, Medical and Dental Building, 3900 Reservoir Road NW, Washington DC. IIRM offers membership to AIMS member races at an introductory rate of USD100 for one year. For a limited time members can apply for a grant to cover the one-year membership. Up to 100 eligible events will be awarded such grants provided by the UK-based Matthew Good Foundation (MGF). The BMW BERLIN-MARATHON will stage a unique contest on September 24: for the first time in the history of the event the top three marathon runners in the world will be on the start line as the Kenyan duo of Eliud Kipchoge and Wilson Kipsang take on Ethiopia’s Kenenisa Bekele. Eliud Kipchoge’s avowed intention is to break the world marathon record of his compatriot Dennis Kimetto, which the latter achieved in Berlin in 2014 with his time of 2:02:57. Kichoge had a kind of “lab test” at the beginning of May when he ran 2:00:25, the fastest time ever for the marathon distance, on the Formula One circuit of Monza in Italy. But this feat was achieved with the help of a team of substitute pacemakers who also formed a wind shield from start to finish. Under normal race conditions a maximum of three pacemakers is permitted and no substitutes are allowed. Kipchoge later commented: “In Monza I was so close to breaking the two-hour barrier. 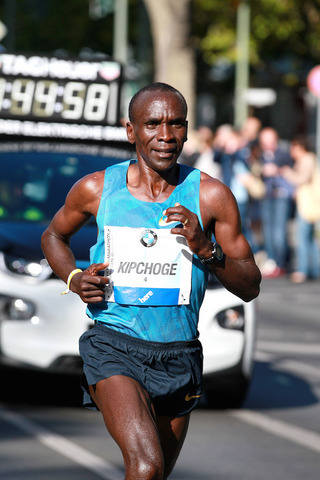 The BMW BERLIN-MARATHON represents for me the right opportunity to attack the official world record.” At the age of 32 Eliud Kipchoge can look back on a long and successful career as a long distance runner. He won the world 5,000m title in 2003, silver and bronze medals at the Olympic Games over the same distance in 2004 and 2008 respectively and is the reigning Olympic Marathon champion, thanks to his victory in Rio in 2016. The greatest day in the 35-year-old Wilson Kipsang’s career so far was four years ago in the 40th edition of the BMW BERLIN-MARATHON when he took 15 seconds off the world record of his compatriot Patrick Makau’s time of 2:03:38. But Kipsang’s record of 2:03:23 stood as the world record for just 12 months: in 2014 Dennis Kimetto became the first man to run the marathon under three hours with his 2:02:57 on Berlin’s renowned fast course. That remains the world record. Kenenisa Bekele went within six seconds of the world record last year on the Avenue of June 17 and did that despite suffering muscle problems several times during the second half of the race. He fought back from each bout of muscle cramp and turned his superior basic speed to winning effect at the finish. The 35-year-old Ethiopian is the most successful long distance track runner in history. Three times Olympic champion and World champion on five occasions at 5 and 10,000m, he has also won 11 World Cross Country titles over the short and long distances. For good measure, he also holds the world records for 5 and 10,000m. Kenenisa Bekele turned to the marathon in 2014. The BMW BERLIN-MARATHON on September 24 will be his eighth following his winning debut in Paris with 2:05:04, then Chicago (4th in 2:05:51), a dnf in Dubai in 2015, London in 2016 (3rd in 2:06:36), Berlin 2016 (1st in 2:03:03), another dnf in Dubai 2017 and London (2nd in 2:05:57) in 2017. Many experts consider Kenenisa Bekele’s achievements in the long distances have earned him the distinction of being the greatest all-round runner of all time. The second AIMS Children’s Series race of 2017 was held on 27 July in the city of Erbil, the capital of the Kurdistan region of Iraq, approximately 350km north of Baghdad. This is the first time the AIMS Children’s Series has ever hosted an event in Iraq. More than 900 children, boys and girls, participated in the 2km fun run. The event was staged by The Erbil Marathon organisation for Sport and Peace. 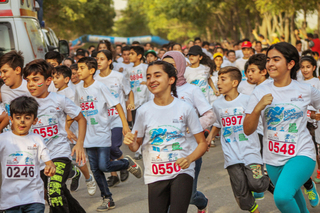 The race took place in Samai Abdulrahman Park, the largest and one of the most beautiful parks in Iraq. Several international NGOs (Non-Government Organisations) and private companies supported the race. UNICEF was associated with the event and assisted activities. NIGA TV, a well-known local specialist children’s channel was the media sponsor of the event. More than 35 media agencies, local and national, were present and reported very positively. Three TV channels covered the event live. Many officials and consular representatives attended including the Governor of Erbil, Nawzad Hadi Mawlood. In his speech at the closing ceremony, he gave deepfelt thanks to AIMS and the Erbil Marathon organisation for staging such an inclusive event. He stressed the importance of sport, and especially running, for children and pledged his full support for future events. The 20km & 10km International de Marrakech (MAR) will take place on Sun 1 October 2017, not Mon 16 October 2017 as previously published. The AUDIREVI Lake Maggiore Half Marathon & 10K (ITA) will take place on Sun 4 March 2018, not Sun 11 March 2018 as previously published. The Dhiraagu Maldives Road Race (MDV) will take place on Fri 6 October 2017, not Fri 11 August 2017 as previously published. The UNICEF Charity Run Half Marathon & 10km (HKG) will take place on Sun 26 November 2017, not Mon 27 November 2017 as previously published. The Vadodara International Marathon (IND) will take place on Sun 7 January 2018, not Sun 4 February 2018 as previously published. The Great Hakka Marathon (CHN) will take place on Sat 25 November 2017, not Sat 18 November 2017 as previously published. In 1998 Wolfgang Slawisch was working for the Beachcomber group of hotels at Grande Baie in Mauritius writes Hugh Jones. He had taken responsibility to set up the ‘Beachcomber Mauritius Marathon’. I was invited to measure it but such was Wolfgang’s boundless enthusiasm that he quickly convinced me to run it as well. I returned the following year but after that Beachcomber withdrew their support and the marathon was discontinued. Wolfgang returned to Germany but had been bitten by the Marathon bug. For a while he worked with Munich Marathon and was always a lively presence at the Berlin Marathon expo. 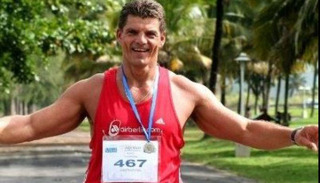 After another false start in 2004 Mauritius Marathon finally got back on its feet in 2010. Wolfgang was back in the fray. He was a man of strong loyalties. His attachment to Mauritius during his time there was continued through personal sponsorship of a child at the SOS village as well as ensuring that the Village became an official charity partner of the Marathon. After so much time spent promoting Wolfgang ran the 2011 edition – and of course wrote about it afterwards in glowing terms: “As the road continues to climb and descend one runner after another overtakes me. Most offer a smile and a cheer, ensuring my resolve to finish. I stop at a roadside shop to buy an ice cold drink. It stops raining, the sun breaks through the clouds and my mood brightens. Waves thunder against the distant reef, while surfers ride them closer to the shore, and the sight of the beach lures me on. Wolfgang also picked up a connection with the Reggae Marathon in Jamaica to promote the two similar but non-competing events. Eliud Kipchoge of Kenya is currently the best marathon runner in the world. The 2016 Olympic champion is aiming to run faster at the BMW Berlin Marathon on September 24 than his compatriot Dennis Kimetto who set the world record on the renowned fast course in 2014, stopping the clock at 2:02:57. Kipchoge was only eight seconds slower than Kimetto in the 2016 Virgin Money London Marathon. A few months later he dominated his rivals to win the Olympic title in Rio. The Kenyan knows all about the Berlin course: he won in 2015, running 2:04:00 despite the insoles of his running shoes flapping for much of the race. Two years previously he finished second in Berlin with another impressive time, 2:04:05 while his compatriot Wilson Kipsang broke the world record with 2:03:23. Kipchoge’s personal best is 2:03:05, set when he won London in 2016. The BMW Berlin Marathon is an Abbott World Marathon Majors event and an IAAF Gold Label Road Race. At the beginning of May Eliud Kipchoge took part in a “Laboratory Test” under special conditions on Monza’s Formula One circuit and ran the fastest time ever recorded for the marathon: 2:00:25. However, this was achieved with practices not permitted in normal races. For example pacemakers were rotating. Eliud Kipchoge has made clear his objective in Berlin: “I was very close to breaking the 2 hour barrier in Monza. 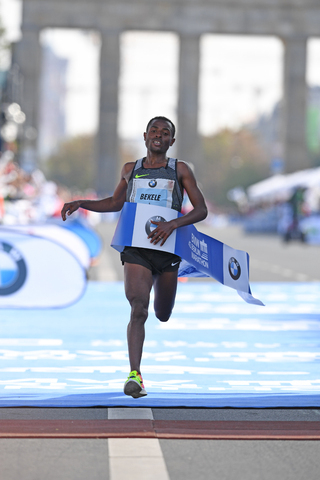 Now I believe the BMW Berlin Marathon is the perfect venue for attacking the official world record.“ It is the first time in the long history of the BMW Berlin Marathon that a men’s Olympic marathon champion will compete in the elite field. The Kenyan is 33 and can look back on a long and consistently successful career as a long distance runner. He became the World 5,000m champion in 2003, won silver and bronze at the same distance in the Olympic Games of 2004 and 2008 respectively and is the reigning Olympic Marathon champion. So far ten world records have been broken at the BMW Berlin Marathon – three by women and seven by men. The last six men’s world records have been set in Berlin, beginning in 2003. The Buenos Aires International Marathon (ARG) will take place on Sun 15 October 2017, not Sun 8 October 2017 as previously published. The AUDIREVI Lake Maggiore Half Marathon & 10K (ITA) will take place on Sun 11 March 2018, not Wed 14 March 2018 as previously published. AIMS is glad to support a global project called “Global Running Day” organized by our friends NY Road Runners. This event will be on 7 June 2017. It is a day for people around the world to celebrate the joys of running. It is a worldwide celebration of the sport; a way for runners of all ages and abilities to share their passion for running and inspire others to get moving. As we are a Global Running Organization with member races from all around the world we have been invited to take part of this initiative to help promote running in society at large. We invite you, the AIMS Family, to be part of this running movement, to celebrate our sport in the best way we are able to. Thousands of runners from different nationalities will celebrate this day and become ONE. Let’s run and save the date! On 7 June 2017, people everywhere will celebrate the joys of running. You can be a part of Global Running Day! We invite you to take the pledge to run on Global Running Day, spread the word, and join in the worldwide fitness fun! Participation is easy—just pledge to take part in some type of running activity on 7 June 2017. It can be a solo lap around the block, a long run with friends, or even a game of tag with your kids. The key is to share your passion for the sport and inspire others to get moving. And speaking of kids, the Million Kid Run on Global Running Day aims to get young people moving. The goal is to have a million kids around the world pledge to run on 7 June 2017. The Million Kid Run is about making fitness fun and inspiring kids to embrace running as a way to get healthy and fit. After you make your pledge, get your sons, daughters, nieces, nephews, and students to choose their running activities and be a part of something incredible. Getting involved is easy. Simply visit www.globalrunningday.org and commit to run on 7 June 2017. You’ll add your name to the list of runners from all over the world who are coming together to celebrate the sport. The pledge page is designed for groups and individuals, kids and adults, able-bodied runners and athletes with disabilities. Pledge for yourself and/or your group—then check out the counter to see how many people from all over the planet will be joining you on the big day. The Maratona di Torino (ITA) will take place on Sun 29 October 2017, not Sun 1 October 2017 as previously published. The 2018 event will be planned for Sun 4 November 2018, not Sun 7 October 2018 as previously published. The Mizuno Hong Kong Half-Marathon Championships (HKG) will take place on Sun 10 December 2017, not Sun 17 December 2017 as previously published. Although his best time is almost eight minutes slower than the course record, Uganda’s Moses Kipsiro is expected to challenge a contingent of Ethiopian runners at the Scotiabank Ottawa Marathon on May 28. The 30-year old three-time Commonwealth Champion (5,000m/10,000m) has been a major force on the track for the past decade but has had his share of troubles. At the 2008 Olympics, he missed the medal podium by one place. In London four years later, he fell during the Olympic 10,000m final and wound up a disappointed 10th. But it was only a year ago that he turned his attention to the marathon recording his personal best time (2:14:18) at the 2016 New York Marathon where he finished 7th. Now he is preparing to show the athletics world what he is really capable of in the classic distance. “So far I have only run two marathons and so I am still learning the event,” he says from his training base in Kaptagat, Kenya. “On my debut in Hamburg (April 2016) I was on 2:06 pace until deep into the race, when my body started to shut down. “I did train hard for my two previous marathons. I do feel I learned from those experiences and now I am ready to show my best at the marathon distance,” he says. “My training is going very well. I am really pleased to have had a sustained period of no injuries, which has been the biggest issue for me the past few years. Kipsiro was introduced to PACE Management Director Ricky Simms, who also manages Usain Bolt and Mo Farah by fellow Ugandan Boniface Kiprop. Within a year of working with Simms, he won the coveted African 10,000m title. Under Simms’ direction Kipsiro moved to England during the summer track season where he trained with Mo Farah, among others. These days his marathon program is overseen by Mike Skinner, a British international runner who works for PACE. At the 2015 Delhi Half Marathon Kipsiro ran 60:41, an indicator that he has enormous potential at the full marathon distance. The hella hamburg halbmarathon (GER) will take place on Sun 1 July 2018, not Sun 24 June 2018 as previously published. Hosea Kiprotich-Rutto from Kenya in 2:17:49 and Hungarian Olympian Tünde Szabo in 2:54:06 are the winners of the Salzburg Marathon in Austria. Rutto led an all-Kenyan podium in Mozart’s hometown with his compatriots Samuel Kamau-Njeri in 2:23:19 and Abraham Kipchirchir-Limo in 2:25:53 in second and third place. The women’s race produced a dramatic finish. Tünde Szabo came from behind to storm past long-time leader Pamela Chemurgor-Talam with only 400 metres to go to the finish at Mirabellplatz. A visibly exhausted Chemurgor finished second in 2:55:14 ahead of Tatiana Mitkina, a Russian who lives in Germany, in 2:56:49. In total 6,457 runners from 70 countries had registered for one of the running events at the weekend, 998 of them for the full marathon. Temperatures of 11°C and dry conditions in the first 2:45 hours of the race provided favourable circumstances while the wind was a challenging factor in parts of the course. The Salzburg Marathon has been certified as a 5-star quality road race by European Athletics. The women’s pre-race favourite Pamela Chemurgor-Talam seemed to live up to the expectations. She went into the lead right from the start and covered the first half in 1:17:26. At that point she was almost six minutes faster than Tünde Szabo who ran her race in second position. Chemurgor suffered badly in the final stages of her first marathon outside Kenya. Szabo came closer and closer. The 28 year old marathon Olympian at Rio 2016 edged the leading Kenyan on the final stretch and celebrated another marathon victory after having won the marathons in Verona 2016 as well as in Cluj and Radenci 2014. 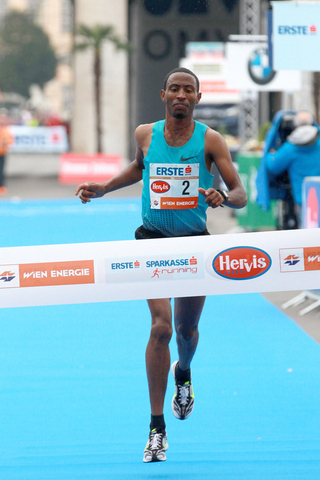 Half marathon wins went to Filmon Abraham, a runner from Eritrea based in Germany, in 1:06:34 in his debut at the distance and Austrian Conny Köpper in 1:22:54. The 10k race was dominated by Mustafe Abdilaahi in 32:07, a Somalian who has lived in Salzburg since 2014. Marika Rubino from Italy won the female category in 39:24. The SOPAL SFAX Marathon International Olive Trees (TUN) will take place on Sun 10 December 2017, not Sun 17 December 2017 as previously published. 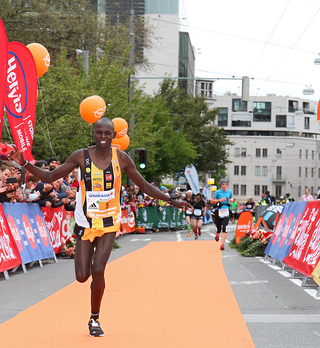 Uganda’s Robert Chemonges is the winner of the 15th METRO Marathon Düsseldorf with a personal best. The 19-year-old clocked a fine 2:10:31 in windy conditions, which should secure qualification for the World Championships’ marathon in London this summer. Norway’s Weldu Gebretsadik took second with 2:11:16 and also qualified for London while Yared Shegumo of Poland was third. The runner-up from the European Championships in Zurich 2014 clocked 2:12:33. Portugal’s Doroteia Alves Peixoto took the women’s race with 2:32:00, improving her personal best by 4:01 minutes. Sara Makera of Tanzania, who had been in the lead for most of the race, was second in 2:33:08. Third placed Carmen Martinez Aguilar from Paraguay ran a national record of 2:35:17. All three achieved their national qualifying times for the World Championships. Including running events staged parallel a total of around 16,000 runners entered the METRO Marathon Düsseldorf. Close to 4,000 of them were running the marathon. A group of six men, including two pacemakers, passed the half way mark in 64:53. When the rabbits dropped out four kilometres later there was a good mix of nationalities left in the first group: Josphat Ndambiri of Kenya, Robert Chemonges of Uganda, Poland’s Yared Shegumo who grew up in Ethiopia and Weldu Gebretsadik, who switched from Eritrea to Norway. It was just a week ago when Uganda’s superstar Stephen Kiprotich came in second at the Hamburg Marathon. Now a fellow-countryman turned out to be the surprise winner of the METRO Marathon Düsseldorf. “I am now number three in Uganda behind Stephen Kiprotich and Munyo Mutai, so I think I will be selected for the World Championships,” said Chemonges, who one day hopes to run 2:06. In the women’s race Sara Makera sprinted away right from the start, covering the first kilometre in 3:08. At 10km she was still running a 2:25 pace with a split time of 34:27. The runner from Tanzania, who had a personal best of 2:45:00 before Düsseldorf, slowed but kept a significant lead until late in the race. She passed half way in 1:13:29 and 30 k after 1:45:38. With 12km to go 29 year-old Makera was still almost two minutes ahead of Doroteia Alves Peixoto. However she then slowed dramatically in the final section and the Portuguese passed her less than two kilometres from the finish line by the Rhine. Third-placed Carmen Martinez Aguilar improved her own Paraguayan record by 44 seconds to 2:35:17. Mary Keitany ran the second fastest ever women’s marathon time in the Virgin Money London Marathon on 23 April. Her time of 2:17:01 is the fastest ever run in a women-only race, surpassing the 2:17:42 set by Paula Radcliffe in the 2005 London Marathon. The fastest ever Marathon time run by a woman is 2:15:25 by Paula Radcliffe in the 2003 London Marathon — a “mixed gender” race in which the women were paced by men. 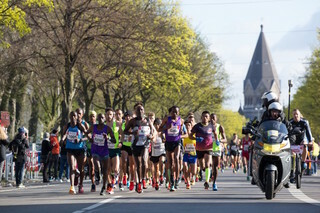 A record number of 42,766 runners from 125 nations entered the various events of the 34th Vienna City Marathon, which is Austria’s biggest sporting event and an IAAF Gold Label Road Race. It is the fifth time in a row that the events of the Vienna City Marathon registered more than 40,000 athletes. Almost 9,000 athletes entered the marathon race. A new 10 k event on the eve of the Vienna City Marathon saw Austrian champions crowned at this distance: Andreas Vojta and Andrea Mayr took the honours on the city centre course with times of 29:54 and 34:57 respectively. 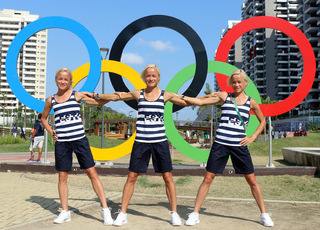 Estonia’s triplets Lily, Leila and Liina Luik participated in the race as the only invited international runners. In a tight men’s finish Ethiopia’s Mekonnen held off the Olympic Marathon Champion from 2012, Stephen Kiprotich of Uganda. Mekonnen clocked 2:07:26 while Kiprotich ran 2:07:31 in difficult weather conditions with wind, rain and even hail. Kenya’s Jacob Kendagor finished third in 2:08:50. Portugal’s Jessica Augusto came from behind to win the Haspa Marathon Hamburg with 2:25:30. She was third for much of the race, but caught Ethiopia’s Ifa Megertu and Kenya’s debutant Viola Kibiwot at around 30 k before stamping her authority on the race. Megertu finished second in 2:29:47 while Kibiwot took third in 2:30:33. 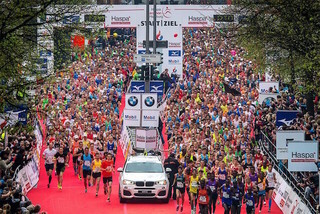 More than 16,000 runners entered the Haspa Marathon Hamburg. Hamburg’s reputation for fields of solid quality leading to strong competition was set for its latest chapter as the elite and mass fields set off at 9 am local time: the 2012 Olympic champion Stephen Kiprotich was intent on victory and the course record to secure his Ugandan team place at this year’s World Championships in London, while Ethiopians Tsegaye Mekonnen and Tsegaye Kebede were keen to show they retained the winning touch. The women’s elite field reflected a broad range of international interest with Jessica Augusto talking pre-race of her ambition to break, one day, the Portuguese record of Rosa Mota: 2:23:29, set in 1985. The city’s weather always has the potential for surprises and the early stages brought hail storms. Nonetheless, the men’s lead pace was consistent, going through 5 k in 15:02 and 10 k in 30:05. Stephen Kiprotich was towards the back of the lead pack, well aware that this tempo was right on course to break his own Ugandan record of 2:06:33. The pace was metronomic, ticking along to set up a tight finish. The expected big group leading through halfway – 1:03:21 – contained some less familiar names such as Kenya’s Gilbert Masai and Limenih Getachew of Ethiopia to the fore. By 25 k Tsegaye Mekonnen had taken the lead with Masai 11 seconds back and Stephen Kiprotich 16 seconds adrift. They remained on course for a finishing time of around 2:06:30. 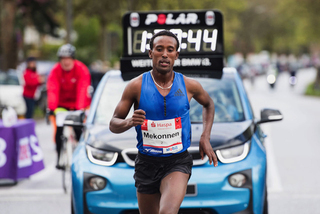 Mekonnen, who made a stunning teenage debut in the marathon to win Dubai in 2:04:32 in 2014, was the man who had, at least in theory, the fastest gears. Tsegaye Mekonnen’s tactics appeared to be going to plan as he led through 30 and 35 k, his lead over Stephen Kiprotich then 19 seconds with the Kenyan Robert Chemosin moving up to third, 34 seconds back. But Stephen Kiprotich is a master of competition when it is man against man, as his Olympic and World Marathon titles have proven. At 40 k Mekonnen and Kiprotich were stride for stride, going through in 2:00:46. The Ethiopian found an extra gear to go clear around the final bend, winning by five seconds. It has been a long wait for Tsegaye Mekonnen to regain his winning form, over three years since that impressive debut which made him the fastest teenage marathoner ever. “I never doubted I would win another marathon. My problems were injuries over the past few years but I never doubted that I would win again one day,” reflected Tsegaye Mekonnen. Jessica Augusto was the fastest in the field going into race with her best of 2:24:25 and bags of marathon experience to match, having arrived at the classic distance via the traditional route of cross country and track success. In contrast, Kenya’s Viola Kibiwot was a debutant, having decided to move from track to road on the advice of compatriot and Olympic Marathon champion Eliud Kipchoge. Portugal’s Augusto appeared to be upstaged as Kibiwot and Ethiopian Ifa Megertu led the early stages, going through 10 k in 34:06. By halfway, reached in 1:11:18, the duo were 37 seconds ahead of Augusto with Tanzania’s Magdalena Shauri a distant fourth. While the national record of Rosa Mota was out of reach, victory was in sight for Jessica Augusto as she extended her lead. Consistency is her strong point, having run under 2:26 now on six occasions but this was her first marathon victory. “When I saw the weather today, I decided it was not a day for concentrating on breaking the national record. It was tough because of the weather and I am delighted to be a marathon champion at last,” said Jessica Augusto. Ifa Megertu ran 2:29:47 for second place while Viola Kibiwot made a creditable debut with third in 2:30:33. Experienced though men’s and women’s champions are in the marathon, Tsegaye Mekonnen and Jessica Augusto both agreed that running Hamburg was a first in more ways than one: they had never run a marathon which brought hail storms and sunshine together! London’s Olympic Marathon champion Stephen Kiprotich is ready for a fast race at the Haspa Marathon Hamburg on Sunday. The 28-year-old from Uganda hopes for a 2:06 time in Germany’s biggest spring marathon. And he insists that his friend and training partner Eliud Kipchoge would be happy for him to break his course record. Back in 2013 Kipchoge won his debut in Hamburg, bringing the course record down to 2:05:30. While he is one of five sub 2:07 runners on the start list the favourite for the women’s race is Jessica Augusto. The Portuguese will go for Rosa Mota’s 32 year-old national record of 2:23:29 on the fast Hamburg course. Meanwhile the London Olympic Marathon Champion Tiki Gelana of Ethiopia has had to withdraw because an injury. Around 16,000 runners have entered the 32nd edition of the Haspa Marathon Hamburg. “More and more elite runners realize that we can offer them very good conditions for running a fast time. This explains why the fields are so strong,” said race organiser Frank Thaleiser. “Eliud is a very good friend. We train together and spend time together. He was the one who recommended me to run Hamburg this spring,” said Kiprotich, who also took the World Championship marathon in 2013, one year after his Olympic triumph. “I knew before that Hamburg has a good and fast course,” added Kiprotich, who has a personal best of 2:06:33. Being the first Olympic champion ever in the elite field of the Haspa Marathon Hamburg Kiprotich will wear bib number 1. “It is an honour to wear this number. I have never had a number 1 going into a marathon. This is great,” said the Olympic Champion. While current Olympic Champion Eliud Kipchoge is currently training for a sub two hour marathon project, one might assume that he was quite a bit ahead in the training sessions. However it was different. “I was not far behind Eliud,” said Kiprotich, who hopes to run a 2:06 time on Sunday providing the weather is suitable. Jessica Augusto is the favourite for the women’s race and her best of 2:24:25 has the fastest lifetime performance in the field by a couple of minutes. The Portuguese hopes to break a significant national record on Sunday. “I want to improve the time of Rosa Mota. I think it is possible. I have trained for this and all went well,” said Augusto. Mota clocked 2:23:29 back in 1985 when finishing third in Chicago. However Augusto could be challenged by a debutant. Viola Kibiwot is confident that she is ready for the marathon distance. “I decided to turn to the marathon back in September 2016. First the training with the longer distances was tough, but then I got used to it. I am mentally and physically ready for the marathon,” said the 33 year-old Kenyan, who has a 31:11 PB at 10 k and was fourth in the 5,000 m final of the World Championships in Moscow 2013. Ten runners feature personal bests of sub 2:10 in what is likely the best ever men’s elite field in the history of the Vienna City Marathon. Depending on weather conditions organisers hope for a winning time of 2:06 or may be a bit faster with the current course record standing at 2:05:41. “If the weather is fine I want to run 2:05 or 2:06 on Sunday,” said Deribe Robi during today’s press conference in Vienna. With a personal best of 2:05:58 the Ethiopian is the second fastest runner on the start list behind Kenya’s Eliud Kiptanui (2:05:21). “I am looking forward to Vienna and hope for a fast race. Of course much will depend on the weather,” said Deribe Robi. While it should be mainly dry with temperatures just below 10 Celsius at the start the wind could be a problem on Sunday. The 26 year-old Ethiopian, who runs a cattle farm with 25 cows and 11,000 chickens back home, clocked his PB when taking second place in Eindhoven two years ago. “In that race I suffered of a back problem in the final section. So I think there is still room for improvement. In the future I hope to achieve a time of 2:04,” said Deribe Robi, whose idol is Haile Gebrselassie. The Ethiopian superstar is a well-known figure in Vienna. He won the half marathon, which is staged parallel to the marathon, three times in a row from 2011 to 2013. It will be the third start in a row for Suleiman Simotwo at the Vienna City Marathon. The Kenyan achieved his best result here a year ago when he was third in 2:10:15. “Vienna is one of my favourite races. I was already competing in Austria at the beginning of my career,” said Suleiman Simotwo, who has a 1,500 m PB of 3:31.67 from 2006. “On Sunday I hope for a good time,” added the Kenyan, who sometimes trains with Wilson Kipsang and admires Paul Tergat. Eliud Kiptanui had to delay his flight to Vienna due to a visa issue. While he missed the press conference he is expected to arrive tomorrow morning. The Kenyan is said to be in fine form. It is eleven years ago that the men’s winner of the Vienna City Marathon did not come from either Kenya or Ethiopia. Back in 2006 Morocco’s Lahoussine Mrikik caused a surprise by taking the race in 2:08:20. A fellow-Moroccan is among the favourites and could halt the dominance of Kenyan and Ethiopian athletes in Vienna: With a personal best of 2:07:55 Mustapha El Aziz is the third fastest runner on the start list. “It is my goal to break my personal best on Sunday,” said El Aziz. While he could not break 2:10 last year he did improve significantly in the half marathon with a time of 59:29. A month ago the 32 year-old was second in the Milan half marathon with 61:29. 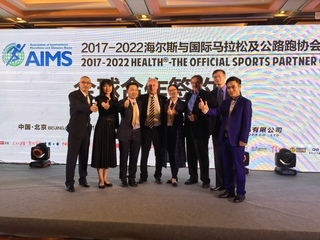 Health Corporation, the Chinese sportswear manufacturer, has become the official Sports Partner of AIMS. The 5-year agreement will see the sports brand work with AIMS to promote running across the globe through to 2022. The deal was announced at a press conference in China on 12 April 2017 headed by Paco Borao, President of AIMS, and Juchong Wang, President of Health Corporation. Founded in 1984, Health makes a range of high quality sports shoes and sportswear. AIMS also announced a separate agreement with Optimum Concepts, LLC. The USA-based company will assist AIMS to identify and secure sponsors in China that enhance the Association’s existing portfolio of partners. The deal was signed by Paco Borao, President of AIMS and Michael Chen, President of Optimum Concepts. Allan Kiprono and Fate Tola are the winners of the HAJ Hannover Marathon. In what is his biggest career win the Kenyan clocked 2:09:52 in fine but relatively warm weather conditions. Fellow-Kenyan Philip Sanga snatched second place from Norway’s Sondre Moen in the final metres of the race. Both runners were timed with 2:10:07. Moen’s time is a Norwegian record. While Germany’s marathon record holder Arne Gabius dropped out shortly before the 33 k mark due to an achilles tendon problem Fate Tola produced a German victory. The former Ethiopian ran 2:27:48 and secured selection for the World Championships’ Marathon in London this summer. She was well ahead of Ukraine’s Nataliya Lehonkova and Mulunesh Asefa of Ethiopia, who finished with 2:33:20 and 2:37:27 respectively. Including shorter races the 27th HAJ Hannover Marathon had a record entry of 22,200 runners. The event is an IAAF Silver Label Road Race. A group of nine runners passed the half marathon mark in 65:04, hitting almost exactly the target time of 65 flat. While there were still eight in the lead at 30 k (1:32:33) shortly afterwards the group was reduced to five. It was then Philip Sanga, the fastest runner on the start list with a PB of 2:06:07, who took the lead. The group stretched, but Kiprono, Moen, South Africa’s defending champion Lusapho April and Nicholas Kamakya of Kenya managed to catch Sanga. However Sanga pushed the pace again at around 35 k and this time there was some damage. The Kenyan was in the lead with Kiprono and Moen chasing him while April and Kamakya were out of contention. With thousands of spectators lining the street in the sunshine a thrilling battle for victory began. First it was Moen who could not hold on to Kiprono. Then Kiprono caught Sanga and overtook the leader with around four kilometres left. Sanga was also overtaken by Moen before the 40 k mark. But close to the finish Sanga was getting faster again. He could not catch Kiprono, but he just managed to squeeze past Moen before the finish line. 27 year-old Kiprono won his first marathon race in Hannover. “I had spoken to Philip during the race and suggested that we should work together. However he wanted to do it all alone. When I took the lead I was never sure I would win. I just gave everything,” said Kiprono, who ran his PB of 2:09:38 in Frankfurt in 2014. “I want to go back to Frankfurt in October and improve to 2:06 or 2:07,” said Kiprono, who is coached by German Dieter Hogen. Behind Sanga and Moen Kenya’s Kamakya took fourth place with 2:11:35. Three time Hannover winner and course record holder Luspaho April (2:08:32) finished fifth with 2:11:41. This should secure selection for the World Championships in London. Ezekiel Ngimba of Tanzania took sixth place with 2:11:55. In the women’s race Fate Tola left behind her rivals soon after the 10 k mark. When she reached 15 k in 51:48 she was already more than a minute ahead. With split times of 1:13:06 at half way and 1:43:42 at 30k it looked certain that she would break the course record of 2:27:07. However after one of her pacemakers pulled a muscle and dropped out and the other one also stopped with around ten kilometres to go she suddenly slowed. “It was strange, because between 36 and 38k she lost around one minute. Afterwards Fate recovered and was running faster again. But she could no longer break the course record,” said her coach and husband Musa Roba-Kinkal. The German half marathon championships were staged parallel to the marathon in Hannover. Philipp Baar was a surprise winner in 64:57 while Hendrik Pfeiffer showed a fine race taking second place in 65:09 after a long injury break. Sabrina Mockenhaupt won the women’s race in 70:54 from Anja Scherl who clocked 71:09. Kenya’s Joyciline Jepkosgei broke four world records (subject to ratification) in the Sportisimo Prague Half Marathon – just her fifth half marathon to date writes John Mulkeen. 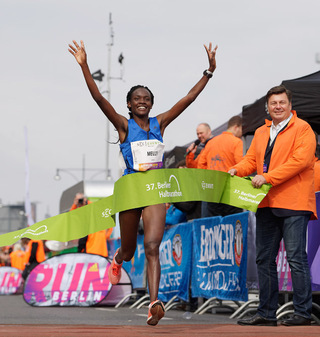 She reached 5km in 14:53 and 10km in 30:04 with defending champion Violah Jepchumba alongside her, besting Paula Radcliffe’s 30:21 from 2003. Thereafter a gap grew as Jepchumba trailed by 3 seconds at 15km (45:37/45:40) as Jepkosgei surpassed Florence Kiplagat’s 2015 record of 46:14. She passed through 20km in yet another world record of 1:01:25 and broke Peres Jepchichir’s recently established Half Marathon record in Ras Al Khaimah by 14 seconds. 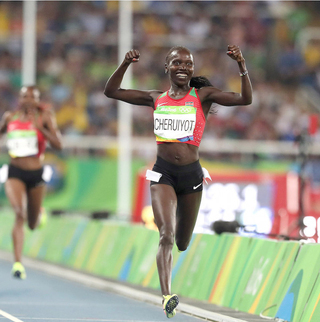 Her previous best was 1:06:08 from that same race – in which Jepchirchir recorded 1:05:06. Josphat Ndambiri has chosen the METRO Marathon Düsseldorf for his comeback race after a long injury break. With his personal best of 2:07:36 Ndambiri is currently the fastest runner on the start list of the METRO Marathon Düsseldorf. A year ago a total of 17,000 runners competed in the marathon and other running events staged parallel in Düsseldorf. During the first part of his career the 32 year-old Kenyan was a top-class 10,000 m runner. He was fifth at the World Championships in Osaka in 2007 at this distance and then improved to a world-class PB of 26:57.36 two years later. With this time Ndambiri was number three in the world in 2009. Two years later Josphat Ndambiri turned to the marathon and ran a perfect debut in Fukuoka. Winning this prestigious event he clocked his personal best of 2:07:36. However a long period of injuries followed and he did not manage to finish another marathon. Two years ago he competed in Hannover and was on course for a sub 2:09 time until around 25 k, before he then dropped out behind the 30 k mark. Now Ndambiri wants to come back strong in Düsseldorf. Fellow-Kenyan Charles Cheruiyot will be among Ndambiri’s strongest rivals. He ran his personal best of 2:09:05 in Warsaw 2014. A year ago Cheruiyot took a fine second place at the Vienna City Marathon, clocking 2:10:09 despite very strong winds. Two Europeans could also do well in Düsseldorf, although they have an African background. Coming from Eritrea Weldu Negash Gebretsadik has recently gained Norwegian citizenship. He was fifth in Rotterdam in 2014 with 2:09:14. Former Ethiopian Yared Shegumo has competed for Poland since 2003. The 34 year-old is the silver medallist from the European Championships’ marathon in Zurich 2014. He ran his PB of 2:10:34 when taking the Warsaw Marathon in 2013. The women’s elite field is not yet finalized. Among those confirmed for the METRO Marathon Düsseldorf is Eri Okubo (JPN) who was fourth in the Tokyo Marathon in 2012 with a time of 2:26:08. Leila, Liina and Lily Luik received a considerable share of awareness at the Olympic Marathon in Rio 2016. The Estonian trio is now heading to the Vienna City Marathon. They will race the Vienna 10K on Saturday, 22nd April, a new 10K race on the day before the marathon takes place. “We look forward to the run in Vienna very much. It will be the first time for us to come to Austria. We heard about the new Vienna 10K at the AIMS congress in Athens in November and immediately got excited about it,” they said. “Saturday becomes a new highlight of the Vienna City Marathon weekend with the introduction of the Vienna 10K. The Luik triplets add much energy to this premiere staging. It shows that the Vienna 10K gets international recognition”, says Race Director Wolfgang Konrad. The new Vienna 10K offers a highly attractive course for all runners. It starts close to the Ferris Wheel in the Vienna Prater, a huge green recreation area, and finishes in front of Vienna Burgtheater in the city centre, where the marathon runners cross the finish line on Sunday. Austrian 10K road race championships are incorporated into the race. Together with kids races Get active 4.2 and Get active 2.0 a “Super Saturday” beckons in Vienna. Their personal bests in the marathon reflect their order of birth on 14th October 1985. Leila ran 2:37:11 as her fastest time, Liina 2:39:42 and Lily 2:40:30. Together they competed at the European Championships in Zurich 2014. Liina and Lily took part in the World Championships in Bejing 2015. Calling themselves “Trio to Rio” they qualified for the Olympic Games in Rio de Janeiro 2016. Liina had to drop out of that race in Brazil. Their common goal is to compete at the Olympic Marathon once again in Tokyo 2020. Kenyans Gilbert Masai and Joan Melly took the 37th edition of the Berlin Half Marathon on Sunday. While Masai was among the top favourites, late-entrant Joan Melly was an unexpected winner. Masai ran a fine 59:57 and was well ahead of Vincent Kipchumba and Reuben Limaa, who finished in 60:32 and 61:43 respectively. Joan Melly was the last name added to the elite field, but she was first at the finish line with a time of 68:45. It was a personal best for the 28 year-old and her first sub 70 minutes’ half marathon. Fellow Kenyans Edith Chelimo was second with 68:57 while Dutch defending champion Elizeba Cherono took third in 70:43. 34,004 runners from 106 nations entered Germany’s biggest and fastest half marathon race. In fine but partly windy weather conditions the men’s race started relatively slow. After a first few kilometres with split times of around 3:00 minutes the pace was picked up. A group of six runners then passed the 10 k point in 28:52. It was Gilbert Masai who started an early and decisive move together with pacemaker Vincent Kipchumba. Running the 12th kilometre in 2:38 he took the lead. Left behind by Gilbert Masai, pacemaker Vincent Kipchumba decided not to drop out but carry on. “I looked around and there was nobody behind me. Since I was in second position I continued running,” said Kipchumba, who ran a personal best of 60:32 on Sunday. There was a fine performance by Germany’s 1,500 m runner Homiyu Tesfaye. 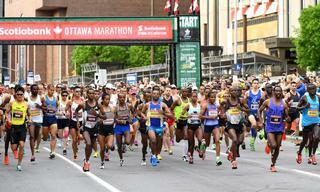 The former Ethiopian was in the leading group for the first seven kilometres. “Then it was getting too fast for me. As I wanted to reach the finish line I had to hold back,” said Tesfaye, who finished seventh in a personal best of 62:58 in his second half marathon. Five years ago he had run 67:17. “I will now concentrate on the 1,500 metres again, but in the future I will run a marathon,” said Tesfaye. Kenyans Joan Melly, Edith Chelimo and Susan Jeptoo formed an early leading group in the women’s race. Jeptoo, who had fallen just after the start but recovered quickly, lost contact shortly before 5 k and finally finished fifth in 71:28. Melly and Chelimo kept the pace high, passing 10 k in 32:27 and 15 k in 48:36. It was with around 5 k to go when Melly started opening a small gap. She kept going and won with a personal record of 68:45, well improving from 70:33. After several years with injury problems Sabrina Mockenhaupt ran a fine race in Berlin. The 36-year-old German finished eighth with 72:11. “It was getting tough, but the atmosphere was great,” said Mockenhaupt, whose long-term target is the European Championships’ marathon in Berlin next year. 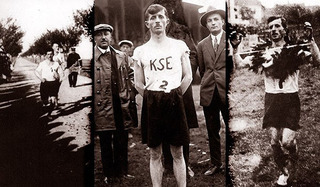 It was 1927 and the Košice Marathon was heading towards its fourth edition. Invitations, with a detailed program, had been prepared and sent out in five languages. Paul Hempel, representing the Berlin club SC Charlottenburg (which today organises the Berlin Marathon) and Pál Király, the Hungarian winner from 1925, were race favourites. Bad weather ruled on race day with thick fog enveloping runners as they set off. The unexpected winner was the Hungarian Jozsef Galambos but his win was no fluke. Jozsef repeated his victory in 1928, 1932 and 1933. Up to today he remains the most successful male runner in Košice Marathon history. It was not only the athletes who attracted attention in the 1927 race. 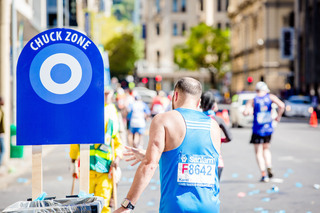 Organisers introduced a new innovation that allowed officials to inform the organisers about the race and split times recorded via telephone stations set up along the course by the local military crew. 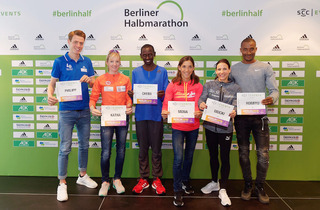 Both Olympic Marathon champions from London 2012 will be on the start line for the Haspa Marathon Hamburg on April 23: after Stephen Kiprotich’s participation was confirmed last month, Tiki Gelana has completed the duo by confirming her entry for Germany’s biggest spring Marathon. “This is probably the best elite field in the history of the races which began more than 30 years ago. 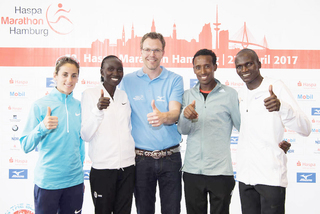 The strong elite fields and the current entry figures promise a great Haspa Marathon Hamburg,” said race organiser Frank Thaleiser. Tiki Gelana’s national record of 2:18:58 makes her the fastest woman runner to have entered the Haspa Marathon Hamburg by a considerable margin since she is the first sub-2:20 performer to compete. In 2011 and 2012 she was unbeaten over the classic distance. After winning in Amsterdam, Gelana, who is now 29, won the Rotterdam title and set the current Ethiopian record. This sequence of success was crowned by her Olympic triumph in London. Her personal best in Rotterdam in 2012 makes her the fourth fastest woman marathon runner of all time. In 2016 she suffered setbacks and the fast course of the Haspa Marathon Hamburg offers a good platform to show her true capabilities once more. Her strongest rivals on April 23 are likely to be Jessica Augusto of Portugal and possibly the Kenyan Viola Kibiwot who is making her debut at the distance. The participation of the men’s Olympic champion Stephen Kiprotich of Uganda, whose best is 2:06:33, and Ethiopia’s Tsegaye Mekonnen has been known for some time. Mekonnen’s personal best of 2:04:32 makes him the fastest man ever on the Hamburg start list. Two more talented Ethiopian runners have now been added to the mix: Tsegaye Kebede, the 2008 Olympic bronze medallist and Tadesse Tola. Kebede’s impressive career so far includes victories against high quality fields in London and Chicago. He ran his personal best of 2:04:38 in winning Chicago and has broken 2:06 on three other occasions. At 29, Tola is one year younger and won a bronze medal in the 2013 World Championship marathon. He ran his best time of 2:04:49 in finishing third in Dubai in 2013. Another athlete to watch should be Eric Ndiema who is making a return to Hamburg. The 24-year-old Kenyan has a good pedigree in the race, finishing second here in 2:07:00 in 2014. His current best is 2:06:07. A total of six athletes who have run under 2:07 are now on the start list for the April 23 race and that includes a trio who have broken 2:05. A clear sign that this is the best quality field ever assembled in the history of the Haspa Marathon Hamburg. The Semi Marathon International de la Ville de Béjaia (ALG) will take place on Fri 19 May 2017, not Fri 12 May 2017 as previously published. The Raiffeisen Bank Bucharest Marathon (ROU) will take place on Sat 14 October 2017, not Sat 7 October 2017 as previously published. The Maratón de las Flores Medellín (COL) will take place on Sun 17 September 2017, not Sun 10 September 2017 as previously published. The Wuxi Marathon (CHN) will take place on Sun 18 March 2018, not Mon 19 March 2018 as previously published. The Novi Sad Half Marathon (SRB) will take place on Sat 1 April 2017, not Sun 2 April 2017 as previously published. Just a week after his 86th birthday the ever-gracious and remarkably talented long distance runner Ed Whitlock died in Toronto on 13 March from prostate cancer writes Paul Gains. Although he was an accomplished British club runner in school and at university Whitlock put the sport on hold while he embarked on an engineering career in Canada. Much later in life he became the first septuagenarian to run under three hours with a 70+ world marathon record of 2:59:10 at the 2003 Scotiabank Toronto Waterfront Marathon, an event to which he became particularly attached. A year later he improved that record with a 2:54:49 at age 73, again in Toronto. Eventually he set world master’s marathon records for age 75+, 80+ and, most recently, 85+ with a time of 3:56:38 set on 16 October 2016 in Toronto. In all he set roughly 25 world master’s records over distances from 1500m to the marathon. Alan Brookes, the race director of the Toronto event, enjoyed a longstanding friendship with Whitlock. “I don’t consider myself to be an inspiring person,” Whitlock had said. “I am not one to stand up on the stage and say ‘you all can do this.’” He was an inspiration to millions around the world, albeit a reluctant one. 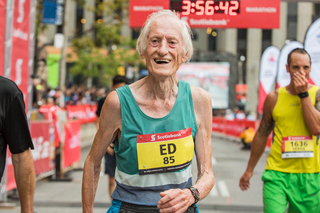 Picture: A smiling Ed Whitlock, moments after setting a world marathon record for runners age 85+ at the 2016 Scotiabank Toronto Waterfront Marathon. 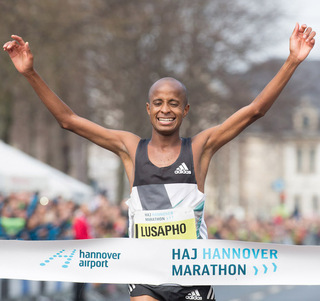 Course record holder and defending champion Lusapho April of South Africa will duel with German record holder Arne Gabius in the HAJ Hannover Marathon on 9th April. However there are three Kenyans in the race with superior personal bests who could upset the two prominent runners. The women’s race will have a German favourite: Former Ethiopian Fate Tola targets Hannover’s course record of 2:27:07. Lusapho April is almost treated as a local hero in Hannover. There is no marathon race where the 34 year-old has competed as often as in this one. It will be the sixth HAJ Hannover Marathon for Lusapho April on 9th April. He is the record men’s winner of the event with three victories — 2011, 2013, 2016 — and established the current course record of 2:08:32 four years ago. Last year he secured Olympic selection with his 2:11:27 performance. In Rio the South African then placed 24th. “Hannover has become my second home for running. I have shown my best performances and celebrated my biggest wins here,” said Lusapho April, who also finished third in New York in 2013. Looking solely at their personal bests a great duel could be on the cards when Lusapho April meets Arne Gabius. The German broke the 27 year-old national record in Frankfurt in 2015 with a time of 2:08:33, improving his personal best to within a second of Lusapho April’s Hannover course record and PB. However organisers announced that three Kenyans have been entered who will make it tough for April and Gabius. Philipp Kimutai has a personal best of 2:06:07 while Nicholas Kamakya and Cheshari Jacob have run 2:06:34 and 2:07:46 respectively. Kimutai was supposed to challenge April already a year ago in Hannover. However due to visa problems he had to cancel his start at the last moment. Now the Kenyan heads the entry list once again. He clocked his personal best back in 2011 when he was fourth in Frankfurt. Kamakya’s PB is six years old as well. However he showed fine form when taking second in Cologne last autumn with 2:10:22. Jacob is a former Hannover champion. He won the race in 2015 with 2:09:32. Two years earlier he ran his PB of 2:07:46 in Frankfurt. “On this occasion we don’t think too much about the course record. We simply hope to create a thrilling contest. If it should become a very fast race as well then it would be even better — but it is not a priority,” said Christoph Kopp, who is responsible for the elite field in Hannover. It will be different regarding the women’s race. Fate Tola is the favourite and she intends to go for the course record. “I always set myself ambitious goals and then fully concentrate on reaching them,” said Fate Tola, who is currently preparing in Ethiopia for the HAJ Hannover Marathon. She was unlucky last summer when she received German citizenship two weeks too late to gain selection for the Olympic Games. However she bounced back with a second place in Frankfurt with 2:25:42. The two-time Vienna City Marathon champion (2011 and 2012) came close to her PB of 2:25:14 and will now hope to show a similar performance on the flat course in Hannover. Ukraine’s Olena Burkovska ran the current course record of 2:27:07 in 2013. While there will be more additions to the women’s field in the coming weeks at the moment Ethiopia’s Ayelu Lemma Geda looks to be the strongest rival for Fate Tola. The Ethiopian has a PB of 2:29:49 from Milan in 2015 where she was second. She is the Rome Marathon champion from 2014. It was seven years ago in April when huge parts of Europe’s airspace were closed after the eruption of the Icelandic vulcano Eyyafyallayöküll. An ash cloud had spread over Britain and then the continent and flying was said to be too dangerous. A number of major marathons struggled getting their African elite athletes and international runners in, among them Vienna and London. Most of the elite field made it in time before the closures to the Austrian capital, but among those missing was Eliud Kiptanui. Seven years later it looks like he will finally find his way to Vienna. The Kenyan heads the men’s elite list of the Vienna City Marathon on 23rd April with a personal best of 2:05:21. The event is an IAAF Gold Label Road Race and adding races at other distances a total of over 36,000 runners has so far entered the 34th edition of Austria’s biggest annual sporting event. A few weeks after missing the Vienna City Marathon Eliud Kiptanui produced headlines not that far away from Austria’s capital. The Kenyan ran an extraordinary course record in Prague, clocking a time of 2:05:39. No-one had thought this could be possible in Prague and no other runner has come close to this mark since then. It showed what Vienna probably has missed. 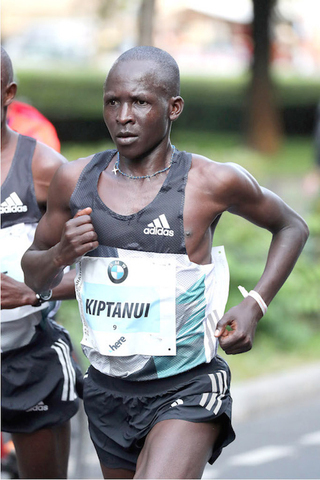 In the meantime 27 year-old Kiptanui placed fifth in the World Championships in 2011 and has improved to 2:05:21 when he finished second in the Berlin Marathon in 2015. There is a second sub 2:06 runner among the men’s elite runners announced by the organisers today: Ethiopia’s Deribe Robi has a personal best of 2:05:58. The 26 year-old clocked this time in Eindhoven in 2015, when he took second place. He showed good consistency with a total of eight sub 2:08 times. Robi won the Marrakech Marathon in 2014, placed third in Dubai a year later, fourth in Rotterdam in 2014 and fifth in Frankfurt in the same year. Kiptanui and Robi will be challenged by Morocco’s Mustapha El Aziz as well as Kenyans Philipp Kangogo and Suleiman Simotwo. El Aziz has a personal best of 2:07:55 with which he took third place in Seoul four years ago. More recently the 32 year-old clocked promising personal bests at 10 k and in the half marathon. First he ran 27:33 in Marrakech, then he clocked his first sub-hour time with 59:29 in Valencia. Philipp Kangogo is a promising newcomer to the marathon. Two years ago he won his debut at the distance in Barcelona with a fine 2:08:16 and then he was second in Ottawa in 2:09:56. Vienna will be his third marathon. In contrast fellow-Kenyan Suleiman Simotwo is a very experienced athlete. It will be the third time in a row that the 36-year-old competes in the Vienna City Marathon. In 2015 he was fifth, then he took third and clocked 2:10:15 despite heavy winds. The former world-class 1,500 m runner who features a personal best of 3:31.67 ran his fastest marathon in Frankfurt, where he finished with 2:08:49 in 2015. The Bengaluru Midnight Marathon (IND) will take place on Sat 16 December 2017, not Sat 9 December 2017 as previously published. 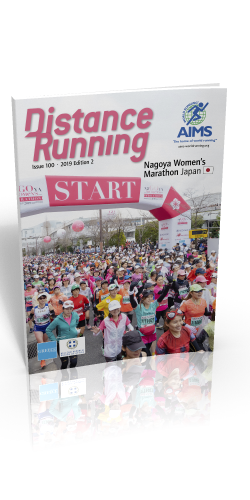 Among the 410+ members of AIMS spread throughout 110 countries and territories there are 22 in Japan, many of them with more than 10,000 runners participating. By eliminating the language barrier, this new website is expected to bring Japanese runners and worldwide AIMS member races much closer to each other. The site will provide the Japanese media with AIMS news releases translated from English into Japanese. This will contribute to smoother news distribution in Japan as well as a closer connection between Japanese runners/media and AIMS’ member races around the world. 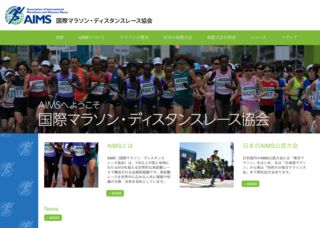 The AIMS website in Japanese www.aims-worldrunning.jp launched at 12 noon in Japan (GMT +9) on 22 February 2017 and complements the AIMS main site in English aims-worldrunning.org . AIMS’ medical partner the International Institute for Race Medicine (IIRM) offers membership to AIMS members on an introductory basis for $100 for the first year. Through the support of the UK-based Matthew Good Foundation a scholarship grant to cover the $100 membership fee is being offered to up to 100 AIMS members who apply. Membership in the IIRM allows all event medical volunteers, EMS partners, and area hospitals to have access to the resources provided in the member-only area of the IIRM website. 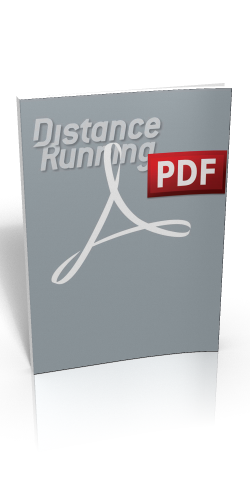 This includes guidelines for treating multiple medical conditions, samples of medical records forms developed by medical directors at the prominent marathons around the world, a comprehensive medical manual, and many educational videos addressing topics related to race medicine. CLICK HERE for a recent press release announcing the grant and its application guidelines. 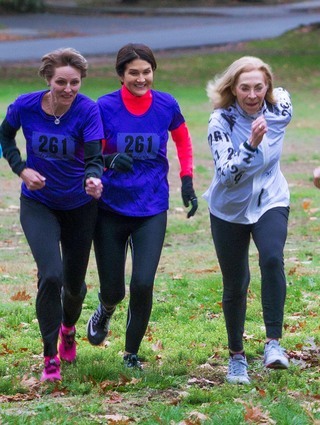 Fifty years after the attempt to bundle her out of the BAA Boston Marathon as an unauthorised entrant — a woman — running pioneer Kathrine Switzer will run the 121st BAA Boston Marathon on 17 April. This time, she will be joined by 114 women and 7 men from 20 counties who are representing and raising funds for 261 Fearless, Inc., Switzer’s global non-profit organisation that empowers women around the world through a social running community. Despite the inauspicious beginning, the Boston Athletic Association (BAA) early on understood the seriousness of women’s desire to participate in the Marathon. In 1972, five years after the ‘Switzer Incident’, the BAA welcomed women as official competitors. Switzer placed third in that race, ran Boston eight times, and posted her personal best of 2:51:37 in the 1975 edition. Registration has opened for the oldest European marathon, the Košice Peace Marathon in Slovakia. The 94th edition takes place on 1st of October 2017. For quick and easy registration, runners can visit the website www.kosicemarathon.com. The marathon course, one of the fastest, was created in Košice 20 years ago for the 1997 IAAF World Half Marathon Championships. That course is still fast and very attractive for both elite and fun runners. In Košice, the gothic pearl of Europe where the fundamentals of the modern marathon movement were set in 1924, runners can discover why it was more recently chosen as European Capital of Culture 2013 and the Best European City of Sport 2016. World champion Peres Jepchirchir broke the women’s world record, but was pushed all the way by former world and course record holder Mary Keitany writes Tim Hutchings. Jepchirchir, who finished in 1:05:06, shaved three seconds off the time her compatriot Florence Kiplagat set in Barcelona two years ago. Fully recovered from a bout of pneumonia at the end of 2016 the 23-year old, 4th in RAK last year, also broke the world record for 20km (mixed race) with 61:40 — 14 seconds faster than the mark set by Kiplagat in Barcelona. In the men’s race World Half Marathon runner-up Bedan Karoki surged to victory over the last 3km after having made much of the running in the second half of the race once the pacemakers had stepped aside. Behind him rising star Yigrem Demelash broke his personal best by 29 seconds. For the first time in the history of the Haspa Hamburg Marathon an Olympic Marathon champion will be on the start line of the elite field: Stephen Kiprotich will be a star attraction on April 23 in Hamburg. The Ugandan caused a sensation when he surprised the favourites to win the Olympic gold in London in 2012, promoted to sporting superstar status overnight in his home country. A year later Kiprotich added to his tally of gold medals in winning the World Marathon title in Moscow. Although Stephen Kiprotich has won two major global titles, victory in a big city marathon is one achievement missing so far in his running portfolio. He did win the Enschede marathon in 2011 with 2:07:20 but success in Hamburg would be of a different order. Another leading contender has also been announced and that is Tsegaye Mekonnen. The 21-year-old Ethiopian is considerably faster than the Olympic champion Kiprotich with his best of 2:04:32, achieved on his sensational marathon debut in Dubai in 2014. His performance was the fastest ever by a junior, though remains an unofficial world record since the world governing body of the IAAF does not recognise junior records in the marathon. The Golden Ring Yaroslavl Half Marathon (RUS) will take place on Sun 3 September 2017, not Sun 17 September 2017 as previously published. The RAHAL Mémorial Casablanca (MAR) will take place on Sun 7 May 2017, not Sun 21 May 2017 as previously published. Allan Steinfeld, a key figure in the world’s original running ‘boom’ that took place in United States during the 1970s, passed away on 24 January at the age of 70. Born a New Yorker on 7 June 1946, Steinfeld was an accomplished college distance runner who attended Cornell University. After graduation in 1971 he began volunteering technical service to the New York Road Runners Club which was set up by NYC race founder Fred Lebow to co-ordinate the organisation of the Marathon and local races throughout the city. As the race grew — from hundreds in the early 1970s to 2000 in the 1976 Five-Borough Bicentennial race and then took off in the late 1970s Steinfeld joined the race staff full-time. He became technical director in 1981. He was the person primarily responsible for getting the show on the road. While his contribution to the sport of distance running and to the organisation of the Marathon is widely acknowledged, what he and Fred Lebow did to promote the Marathon internationally is not so well known. When London Marathon race founder Chris Brasher saw the 1979 New York Marathon and its impact on those who participated and spectated he immediately enlisted the help of Lebow and Steinfeld. They helped him convince the authorities in London that staging a marathon was both possible and worthwhile. But London was not the first. The New York example was the essential impetus behind the Barcelona and Stockholm Marathons when they were set up in 1978 and behind many other marathons the world over. Steinfeld and Lebow became de facto marathon ambassadors advising organisers in places like Belgrade and Siberia on how to put on an event. Where they saw ideas they could use in the New York Marathon they promptly introduced these, rapidly spreading a culture of ‘best practice’. Part of this effort was the establishment of the Association of International Marathons (AIMS) in 1982. Steinfeld had made accurate course measurement part of his field of technical expertise and was instrumental in spreading the practice both in the United States and internationally through the Association. He also instituted a chute system for assigning places and times to all runners even when hundreds were crossing the finish line every minute. This remained in place for mass marathons until the transponder timing system had proved its reliability by the late 1990s. In 1984 Steinfeld was instrumental in the measurement of the Los Angeles Olympic Marathon course which became a model for later practice. He was also Chief Referee for both the men’s and the (inaugural) women’s events. 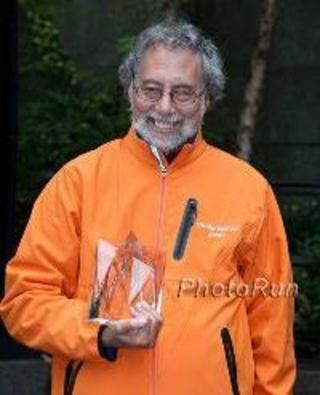 Steinfeld took over from Fred Lebow as the New York Road Runners’ President. After Lebow’s death in 1994 he assumed the posts of CEO and New York City Marathon race director. He retired from these posts in 2005. He was elected an Board member of AIMS in 1993 and a Vice-President in 1999. He became an Honorary Life Vice-President of AIMS in 2007. The Niagara Falls International Marathon (CAN) will take place on Sun 15 October 2017, not Sun 22 October 2017 as previously published. The Vodafone İstanbul Half Marathon (TUR) will take place on Sun 30 April 2017, not Sun 16 April 2017 as previously published. The Dushanbe International Half Marathon (TJK) will take place on Sat 15 April 2017, not Sun 16 April 2017 as previously published. During his recent business visit to AIMS Headquarters in Athens, Greece, the AIMS President, Mr. Paco Borao, had a meeting with the recently appointed new Greek Deputy Minister of Culture and Sports, Mr. Georgios Vasileiadis. Along with Mr. Kostas Panagopoulos, President of the Hellenic Athletics Federation (SEGAS), Mr. Makis Asimakopoulos, General Manager of “Athens Marathon. The Authentic” and Mr. Theo Livitsanos, AIMS HQ Administrator, the President and Deputy Minister had the chance to discuss future strategic plans between the Greek authorities, SEGAS, the Athens Marathon and AIMS, following the successful recently organised 21st World Congress of AIMS in Athens, the birthplace of our sport, and the close collaboration between these organisations which dates back to 2007.